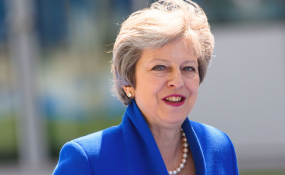 Nairobi — British Prime Minister Theresa May is expected in the country on August 30, in her first visit to Africa since taking over from David Cameron in July 2016. The announcement was made by Kenya's Foreign Affairs Cabinet Secretary Monica Juma on Wednesday during a media briefing at her office along Harambee Avenue. "This visit speaks a lot in trems of our place among the community of nations but also about President Uhuru Kenyatta's global leadership," she said. "We have in the pipeline quiet a number of Heads of State coming in as well as projected visits by President Kenyatta so I think we're in for a busy half a year," she indicated adding that the demand for bilateral talks was high and "engagements strategic and valuable." According to the CS, forthcoming bilateral engagements were mainly focused towards the delivery of President Kenyatta's Big Four development agenda, which will form his legacy when he leaves office in 2022 after serving for his second and final term. The visit by May will mark the second time a sitting British Prime Minister has visited the country after Margaret Thatcher's 1988 visit during President Daniel arap Moi's tenure. In his engagement with May, the Foreign Affairs CS said, President Kenyatta will seek to secure Kenya's business interests post-Brexit in addition to proposals that will improve the ease of trading with Britain. CS Juma said talks are already in high gear to have the United Kingdom visa office re-established in Nairobi to ease the process of acquiring travel documents by Kenyans. She said wide-ranging changes had been made at the Directorate of Immigration and Registration of Persons in bid to guarantee the integrity of travel documents. "Our documentation today is above par. We have in place e-passports with enhanced features and a lot of work has happened in terms of ensuring the integrity and security of our documents from the birth certificates to the identity cards," the CS said. According to Juma, talks with May will also focus on strengthening the existing security pact between Kenya and the UK. The war against corruption will also feature in talks between May and Kenyatta, Juma reaffirming President Kenyatta's commitment to restore integrity in the governance system. "We really are at a good place in terms of our national agenda which aligns very well to the entire democratization, transparency, and accountability agenda globally," she said. May's official visit will be coming hard on the heels of President Kenyatta's visit to Washington on August 27 where he will be engaging US President Donald Trump on issues of mutual importance at the White House. The White House confirmed the August 27 meeting on August 6 when Press Secretary Sarah Sander released an official statement. "Kenya is a vital partner of the United States and President Trump looks forward to discussing ways to broaden the strategic partnership based on our shared democratic values and mutual interests," she said. Sanders said at the time the meeting will feature discussions on stability on the African continent and the broader Indo-Pacific region. "The meeting between the two leaders will reaffirm the longstanding relationship between the United States and Kenya as a cornerstone of peace and stability in Africa and the broader Indo-Pacific region," the statement published on the White House website read. On Thursday, CS Juma said President Kenyatta and Trump will explore ways of bolstering the existing cooperation in trade through the African Growth Opportunity Act (AGOA) as well as capacity building in the area of security with the specific focus of enhancing Kenya's counter-terrorism efforts. "We are going to be discussing ways in which we can increase our quantum in volume into AGOA. We're the key beneficiaries of AGOA so far but there are also a number of lines within the framework that we could enhance," she explained. "We also hope we can begin discussion on post-AGOA arrangements because we've seen huge appetite in that direction," she added.